Families for a Secure Future has gathered a number of resources that we recommend and believe are helpful to individuals, their families and loved ones. We are a ‘coalition’ of: people with disabilities, families, friends, advocates, facilitators, organizations and agencies working together to move individualized funding forward in Ontario. We support the self-determination of persons with disabilities. We believe that all people should have control over decisions concerning where they live, with whom they live, with whom they associate and how they spend their lives. We believe that the person requiring assistance, supported by family and/or others, should have access to and control over the funds allocated for his/her supports. Inclusion Press: Inclusion Press creates person centered resource materials for training events, public schools, high schools, community colleges, universities, human service agencies, health organizations, government agencies, families, First Nations organizations – nationally and internationally. There are powerful books and videos to learn from available on this site. Windsor Essex Family Network: We are a network of family and friends who believe in inclusion and well being of children and adults who have different abilities and challenges. Our lives have been touched by disability. Family Alliance Ontario: Family Alliance Ontario is an alliance of citizens that offers knowledge, tools and networking opportunities to individuals with disabilities and their families to assist them to realize a vision that includes having valued relationships, choice and control in their lives, and enables inclusion through meaningful contribution and participation in their communities. Vanier Institute on the Family: The Vanier Institute of the Family, established in 1965 under the patronage of Their Excellencies Governor-General Georges P. Vanier and Madame Pauline Vanier, is a national, charitable organization dedicated to promoting the well-being of Canadian families. It is governed by a volunteer board with regional representation from across Canada. ABCD Institute: This site provides information and further resources on the Asset Based Community Development of the School of Education and Social Policy of Northwestern University, which features the work of John McKnight and others on sustainable community development. Ontario Independent Facilitation Network (OIFN): Website for the Ontario Independent Facilitation Network (OIFN), which is a provincial network and community of practice whose purpose is to inform, encourage, support and promote independent facilitation and planning in Ontario. Institute on Family Advocacy and Leadership Development: Our Vision is of families being agents of positive social change so the inherent value of people with developmental disability is recognized within a just and inclusive society. Our Mission is to attain positive social roles for people who have a developmental disability through the development and support of advocacy by families and by strengthening the knowledge, role and influence of the family. Our focus is to encourage and support families to speak up for opportunities for people with developmental disability to enjoy the same environment, lifestyle and living conditions that are available to the majority of Australians. Caledon Institute of Social Policy: Caledon is an independent and critical voice that does rigorous, high-quality research and analysis; seeks to inform and influence public opinion and to foster public discussion on poverty and social policy; and develops and promotes concrete, practicable proposals for the reform of social programs at all levels of government and of social benefits provided by employers and the voluntary sector. Gentle Teaching International: This site has a rich collection of resource materials about gentle teaching. Gentle teaching is a proven and loving way to respond to people who may communicate through difficult behaviours. Centre on Human Policy (CHP) of Syracuse University: The website has an extensive publications and resources link on their site. By clicking on the tab Resources and Reports on Community Inclusion, you can directly access a range of articles on person-centred planning, community supports, self-determination, inclusion and many other topics (includes articles by John and Connie Lyle O’Brien and others). Disability Scoop: The premier source for developmental disability news. Disability Weblinks: Disability Weblinks is a collaborative Federal/Provincial/Territorial project undertaken by Ministers responsible for Social Services and developed in consultation with representatives from the disability community. Human Resources Development Canada manages Disability WebLinks under the direction of the Federal/Provincial/Territorial Working Group for Benefits and Services for Persons with Disabilities. The Caregiver’s Living Room: Donna Thomson’s blog is about the ethics and economics of giving and receiving care. Disability is Natural: This site is authored by Kathie Snow. The mission of Disability is Natural is to encourage new ways of thinking about developmental disabilities, in the belief that our attitudes drive our actions, and changes in our attitudes and actions can help create a society where all children and adults with developmental disabilities have opportunities to live the lives of their dreams, included in all areas of life. The Ontario Trillium Foundation: As one of Canada’s leading charitable grant-making foundations, the Ontario Trillium Foundation works with others to make strategic investments to build healthy, caring and economically strong Ontario communities. Integration Action for Inclusion is a non-profit charitable organization dedicated to educational inclusion and living in the community for ALL people who need extra support. The group provides support to parents and friends seeking to enrich the lives of their children. All children have the right to quality education that will prepare them for a full and productive life in the community. It is our belief that the best way to prepare children who need extra support for community life is to educate them alongside their peers. This is achieved through individualized programming and supports for all children. Inclusive Education Resources: This connects to a number of resources on straight forward ways to teach people with developmentall disabilities as well as other children. It is worthwhile for families as well as teachers. Ministry of Community and Social Services: The Ministry of Community and Social Services financially assists with developmental services and programs that support inclusion for adults with a developmental disability and their families. These services allow them to live, work and participate in a wide range of activities in their communities. Community agencies deliver most of the available services and supports. Planned Lifetime Advocacy Network – PLAN: This is an organization built on the belief that through networks we can help families provide for peace of mind: in building a safe and connected life for our family and friends with a disability, we create a sense of belonging that has benefits for us all. PLAN Institute for Caring Citizenship: Plan Institute for Caring Citizenship works to reduce the isolation of people at the margins of society, and to enable the contributions of all members of our community. Global leaders in social enterprise, we connect people, germinate ideas, and incite action. We advocate for policy reform, train leaders, support organizations, create social innovations, facilitate networks, and initiate dialogues. We offer training, consultation, research, and publications – for individuals, families, organizations, support workers, and professionals. We collaborate with community groups, government, and business. PLAN RDSP: Updated information on the Registered Disability Savings Plan (RDSP). Canadian Association for Community Living: The Canadian Association for Community Living is a Canada-wide association of family members and others working for the benefit of persons of all ages who have an intellectual disability. Founded in 1958 by parents of children with intellectual disabilities who wanted supports and services within the community instead of in institutions, CACL has become one of Canada’s ten largest charitable organizations, and has grown into a federation of 10 provincial and three territorial associations comprising of 420 local associations and over 40,000 members. Community Living Ontario supports the activities of their affiliated 100 local associations, by linking them with the information and resources they need and by offering training and consultation. Conversations that Matter: This is an online conference on disability and community living that can be viewed anytime, anywhere. It is developed by Norman Kunc and Emma Van der Klift of Broadreach training. An Everyday Ordinary Life: A blog site that highlights persons with disabilities leading an everyday, ordinary life. Facile Perth: Based out of Perth County ON, Facile Perth’s website is an informative introduction to person directed planning and facilitation. 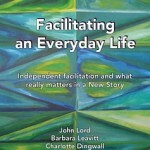 Facilitation Leadership Group: Provides workshops and training to facilitate the ‘New Story’, a vision of society where everyone is welcomed as active and contributing citizens. Realizations Training and Resources: Realizations offers training, consultation, written and electronic resources, retreats and reviews in Canada, the US, and the UK on a variety of topics essential to supporting people who have a developmental disability, mental health issues, or physical challenges, to be full citizens in their community. Capacity Works: Website of Beth Mount, who co-developed one approach to person centered approach to planning called Personal Futures Planning. Helen Sanderson Associates Canada: A rich resource for articles and research on person centered approaches within the human services system. Originally based in the United Kingdom, there is also an HSA Canada. Transition Resources Guide for Students with Disabilities: What do you need to know before you head off to college or university? Learn about your rights and responsibilities, how to advocate for yourself, what financial aid is available and more. 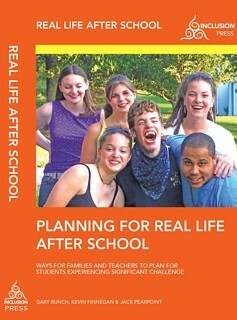 Connections: A guide to transition planning for parents of children with a developmental disability. 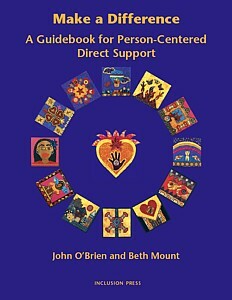 Connectability/Adults: A resource for adults with developmental disabilities. “Inklusion in Kanada – Perspektiven auf Kulturen, Strukturen und Praktiken (Arbeitstitel)” [Inclusion in Canada – Perspectives on Cultures, Structures and Practices], to be published by Martin-Luther-Universität, Halle-Wittenberg.The book will be published in German and English, over the coming year. Read the full Chapter here. You can track these books down and purchase them on your own by following the links or if you are being supported through FSF you can borrow them through our lending library by making arrangements with your Facilitator. Safe and Secure highlights six steps to friendship, community and financial security. 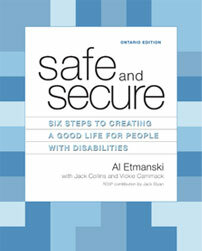 Safe and Secure is a road map to a good life and PLAN’s bestselling guide for families that helps individuals living with disabilities and their relatives plan for a positive future. Order from PLAN Toronto. Developed in response to the question “I love ABCD (Asset Based Community Development); what do I do Monday Morning?” It is based on Mike Green & Henry Moore’s highly regarded work as ABCD organizers, consultants and trainers—these materials support a practical approach to creating community collaborations that work. 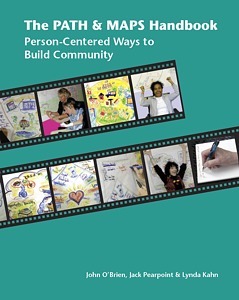 Ways to think about person-centered planning, its limitations, the conditions for its success. This is the first of three volumes by Judith Snow—an autobiographical exploration of powerful learning that began very early. Read, enjoy, expand your horizons. This new book was developed over time as a collection of handouts for our three day course teaching MAPS and PATH. Due to popular demand, we have supplemented it and now it is a stand alone workbook to assist facilitators in their learning and implementing of PATH and MAPS processes. 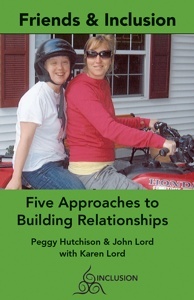 This book offers ways of assessing and planning environments that are person-centered, and that respect the diversity of family and individual situations. It identifies patterns of activity and interaction with the environment that are common to many people with Autism Spectrum Disorder. These are the basis for the “Six Common Modifications” recommended for many persons with complex disability issues to support them to live successfully in the home. Most of the issues that families face can be improved by completing one or more of these modifications.